At the EA Play press conference at last week’s E3, the publisher showed off a new trailer for the upcoming major expansion for Battlefield 1, In the Name of the Tsar. And this week, the folks at IGN published gameplay of the upcoming first map of the expansion, Lupkow Pass, which developer DICE announced will be available in August. The video shows off the new multiplayer map played in Conquest and reveals its seven objective/capture points including one that’s situated on top of a small plateau. The video also shows off the Lupkow Pass’s rocky and snow-covered terrain. Lupkow Pass is the first of four new multiplayer maps coming with In the Name of the Tsar. While Lupkow Pass is releasing around 30 days ahead of the expansion, the other three – Albion, Galicia, and Brusilov Keep – will be released alongside the new expansion. 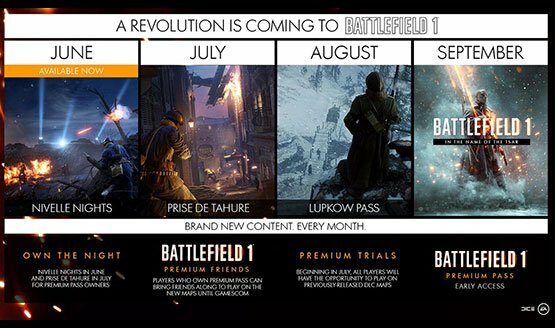 As for the expansion itself, Battlefield 1: In the Name of the Tsar will be released sometime in September for the PlayStation 4 and other platforms.